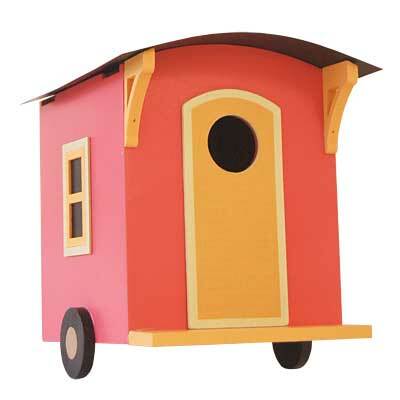 Offer birds a whimsical and lovely accommodation by adding this Home Bazaar Caboose on the Loose Bird House to your yard. Charming details and bright colors on this unit bring a fun bit of style to your garden, while the wood and metal construction offers durability. A vivid, pink paint covers the rectangular shelter, with orange accents creating the door, faux window, brackets, and porch. Black metal forms the arched roof, and wooden wheel shapes on the base further the effect. A 1.25" diameter entry hole rests at the top of the door shape, providing passage for small songbirds. The unpainted interior offers plenty of room for nesting chickadees or wrens, and a hole in the base allows any captured water to drain. Small gaps beneath the roof overhang help keep the roost ventilated, and a removable back panel makes nest checks simple. Easily place this home against a wall using the metal, keyhole hanger, for a fantastic display and easy maintenance. Connect your model train hobby with your birding hobby by adding this Caboose on the Loose Bird House to your yard. Note: Climate and the elements will weather the home and change its appearance over time; however, weathering will add to the item's natural charm without compromising its function. Should you want to preserve the finish (paint) of this house, it is recommended to cover it with a polyurethane product that is recommended for marine use (UV Rated). You should expect that once left outside, the home will weather and require refinishing.